Having a project directed by people with lived experience has been very beneficial. It allowed people with intellectual disabilities to participate in decision-making and empowered them to make change in their own lives. Inclusion Ireland is currently running a project since December 2016 funded by the Irish Human Rights and Equality Commission (IHREC) on ‘Rights Committees’ in disability services. The aim of the project is to develop good-practice guidelines for ‘Equality and Rights Committees’ to be set up in disability services across the country, and for these committees to be underpinned by the principles of equality and human rights. The project also aims to create a training toolkit which will result in people with disabilities delivering training on equality and human rights to their peers. From the beginning of the project, Inclusion Ireland has strived to ensure that people with intellectual disabilities have been at the centre of the project. It can be all too common in similar projects for people with disabilities not to be involved in the decision-making or direction of the project. Therefore, it has been our intention to ensure that people with lived experience of disability are at the centre of this project. For this to happen, it was decided that a steering committee – comprised of people with intellectual disabilities – would be established, and this committee would drive it forward for the duration of the project. 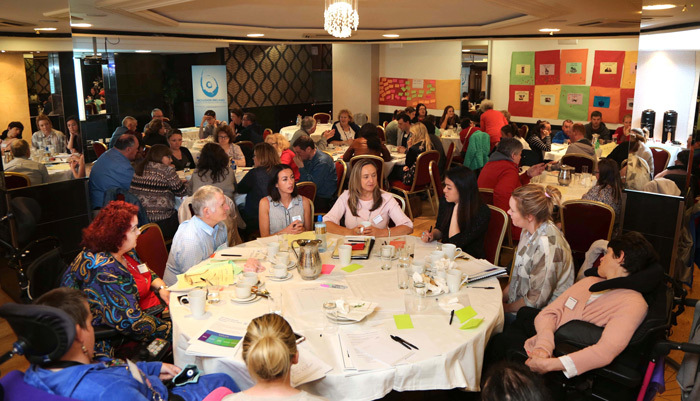 Inclusion Ireland has many contacts that are self-advocates who would be fantastic at driving such a project forward. However, we felt it was important that the application process brought in different experiences and voices from around the country. The recruitment process was treated like any typical job application. People were encouraged to submit an application outlining their experiences, why they wanted to be involved and why they would be a good fit for the steering committee. It was also advertised as a paid position. With this approach, it was our intention to cast our net as wide as possible and to try and reach out to people with intellectual disabilities from throughout the country. We created an advertisement and put it up on our website and social media (such as Facebook and Twitter). We also sent out the advert to many of the contacts we have gathered here in Inclusion Ireland through our mailing list, with the hope that this would make it into disability services around Ireland. In the end almost 60 people responded to the advert and of those 60, 49 were people with a disability. 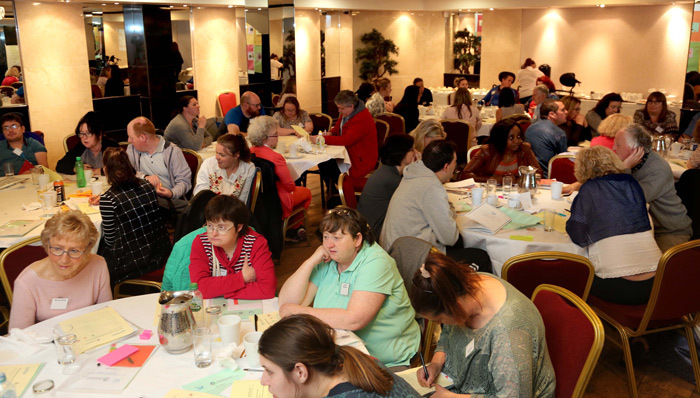 These were people with an intellectual disability from all over the country, and a large amount of these people were individuals who had not been in contact with Inclusion Ireland previously. Others who applied included family members and professionals, who we then kept on file as contacts for future aspects of the project. So to get this sort of response, we considered it a great success. It was a very tough decision but we trimmed the list down to 15 and then again to our final 7. Since the formation of the steering committee, the group has done a huge amount of work. They have drawn up draft Terms of Reference for equality and rights committees. They been involved in hosting a National learning and Sharing Event where they presented the work they had done to self-advocates, professionals and independent advocates working in disability services. The next part of the project will involve 10 people with intellectual disabilities becoming trained in equality and human rights. These 10 individuals will then deliver training to their peers and to professionals, the purpose being to equip people with the tools to promote equality and human rights in disability services around the country. The work done by the steering group so far has shown why it is important to have an inclusive approach to projects involving people in disability services. The benefits can be seen both for people with disabilities themselves, and also for Inclusion Ireland as an organisation that strives to ensure the voices of those with lived experiences are heard, listened to and acted upon. People with intellectual disabilities from around the country were given the opportunity to be at the centre of a project that aims to improve their rights in disability services. This meant they were making the decisions and were deciding the direction of the project from beginning to end. “States Parties shall guarantee to persons with disabilities political rights and the opportunity to enjoy them on an equal basis with others”. “Promote actively an environment in which persons with disabilities can effectively and fully participate in the conduct of public affairs, without discrimination and on an equal basis with others, and encourage their participation in public affairs”. Giving people themselves the opportunity to influence policy, and become empowered to make meaningful change should not be underestimated. It is a value we here at Inclusion Ireland constantly strive to adhere to, and would encourage other advocacy and representative organisations to follow. The benefits of having a project that is led by those with lived experience has also been very valuable for Inclusion Ireland. It has given the organisation the opportunity to reach out and hear from people with intellectual disabilities from all across Ireland. Crucially, it has allowed us to make contact with individuals who have never contacted us before. We have been able to establish links with individuals, to listen to what people with lived experience have to say and crucially, involve them in making positive change. As a result of applying to this project, some of those who were not successful have become members of Inclusion Ireland’s self-advocacy committee and others have become contacts that we regularly engage with for our focus groups or other events with which we are involved. All in all it has been a hugely successful project since it began, allowing us as an organisation to establish fresh links and listen to those with lived experience. Individuals with intellectual disabilities have been empowered – through their participation – to make change and promote equality and human rights for people with intellectual disabilities in disability services. Robert Murtagh is an Advocacy Project Worker with Inclusion Ireland’s Community and Engagement Team. Robert assists in facilitating Inclusion Ireland’s Self-Advocacy Subcommittee and works with other Self-Advocacy groups associated with the organisation. Robert has previously worked in various roles in disability services. Robert holds an MSc. in Equality Studies and a BSc. in Psychology through Science.